No Warranty, Exchange, or Refund on Sale Items. The e-Vic supreme battery is the new generation of intelligent product with strong power. 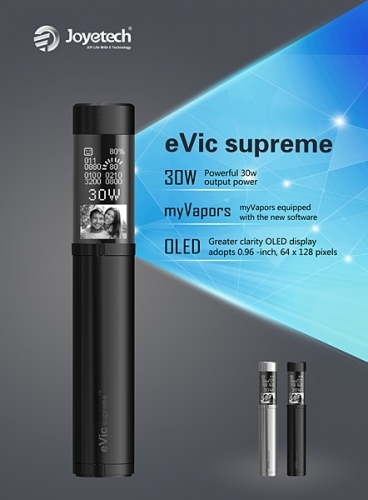 It not only inherits all the best features from Joyetech e-Vic, but also is endowed with its own characteristics. ● The maximum output wattage can reach up to 30W. ● The maximum output voltage is 6V. ● It can support 0.5Ω~5Ω atomizer. More clearly and delicate OLED display screen (adopts 0.96 -inch, 64 x 128 pixels) and 16 grade gray function which can show photos clearly on the device. You can upload the pictures as you like through myVapors from Joyetech. Then the picture will be shown on the e-Vic supreme. The e-Vic Supreme battery adopts brand-new structure design & changeable atomizer connecting rings which improve the strength of device and the reliability of use. The e-Vic supreme battery tube, battery bottom cap, direction key and connect cover are stainless steel which are more upscale and durable. 1 eVic supreme control head. 1 eVic supreme power supply tube. 1 Rechargeable 2100mAh power supply.